We live in an age where with a single click we can shop from anywhere in the world. How easy it is to buy any sort of product contrasts with how difficult it is for companies to prepare multiple orders comprised of few items and to deliver them in a very short time. In response to this challenge, Mecalux Software Solutions offers companies efficient omnichannel management solutions. Easy WMS, as well as the WMS for e-commerce and Multi Carrier Shipping Software functionalities, aim to satisfy the end consumer with on-time deliveries and quality customer service. A ‘channel’ can be defined as a path through which companies and customers interact, for example, a physical point-of-sale, a mobile phone, a webpage, etc. Even though companies like Amazon and Privalia have been online since day one, realistically speaking, traditional retailers have always enjoyed a unique distribution channel —the physical shopfront— and, over time, have incorporated more channels (chiefly online ones). Typically, the online divisions of a company are launched from an already up and running point-of-sale. At this point, a company starts using a multi-channel business model. As a model, it offers customers various channels to interact with a company, with the inconvenience that each channel is independent of the other and the customer cannot change the channel once they have made a purchase (to make a complaint or ask a question). However, there is a growing awareness in the retail sector that it is not enough to count how many channels you are running. More importantly is that these channels are well integrated, so the customer can make his or her purchases through any one of them, interchangeably. Omnichannel shopping is an evolution of multi-channel business and forces all supply chain processes to be explicitly planned to improve the consumer purchasing experience. With the digital transformation of society, consumers are the trendsetters and increasingly selective. They want more than just to buy a product. Instead, they are looking for a sensorial experience (in a physical shop) combined with a digital one (online) and also a social experience (i.e. talking about their purchases on social media). 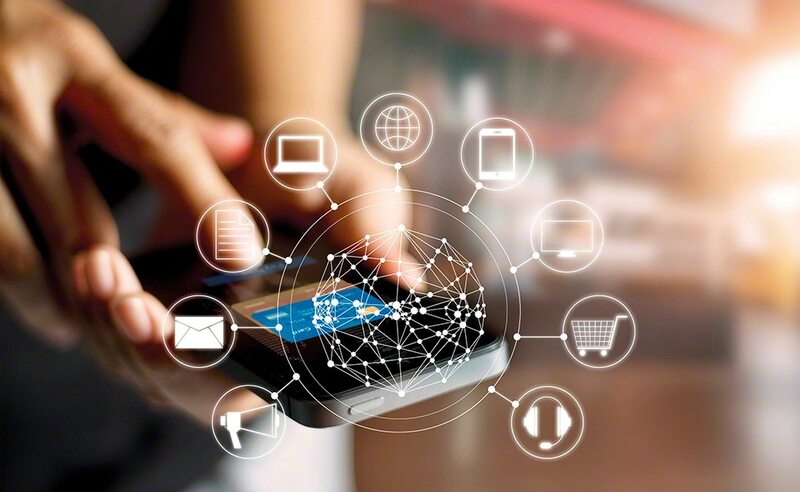 The expansion of omnichannel commerce is due, in part, to the rapid acceptance of mobile devices throughout society and the strong inroads of social media, with a high degree of participation and shopping. How do customers rate a company when they purchase a product? Consistency. Customers want smooth interactions with businesses, no matter the channel. Cohesion. Engagement with companies must be constant, including when the customers want to switch from one channel to another. Security. There must be easy access to all information about an order’s status. Furthermore, customers demand that their online accounts and transactions stay secure. Customer relationships. Customers expect companies to know each time they make a purchase, to have a transaction history and to value their fidelity. The omnichannel model presupposes a transformation in logistics centres, meaning an omnichannel warehouse is different from a traditional one. Obviously, the warehouse space remains the same and includes the same areas (for storage, picking, loading and unloading docks, etc.). The radical difference, one way or another, is in terms of needs: it must manage incoming online orders, those from the physical shops and other potential channels all at the same time. The warehouses of e-commerce businesses receive a huge number of small-sized orders (with few order lines in each) from customers that have made purchases over the Internet. Usually, a vast part of these order items is not kept in stock, meaning businesses must request them from suppliers. Once the goods arrive at the warehouse, they are distributed directly to the orders that are shipped out quickly, without any need to store the item. This picking method is known as cross-docking. The delivery of orders bought online must be done quickly from the moment they are purchased. To do so, agility and well-organised operations are essential. Items that arrive at the warehouse must be organised according to the orders pending completion (taking into account if they correspond to single-product orders or orders that include more than one line of stock). Enabling a zone where each order type is put together helps operators to work in a specific area of the warehouse and, thus, not wander long distances. Into the bargain, companies using an omnichannel model also manage returns, which is otherwise known as reverse logistics. One of the reasons for the boom in the e-commerce sector, other than how easy it is to shop online, is the returns policy. For example, in the case of e-fashion companies, many customers buy clothes on the Internet, try them on at home and return the garments that are not to their liking. Although this is much more comfortable for customers, these returns entail a huge workload and require an extra space to carry these tasks out. That said, what is an omnichannel warehouse like? In the first place, it must be equipped with storage systems that provide the maximum storage capacity possible and, at the same time, streamline order picking. In this sense, direct access racks are vital because they facilitate the handling of products. 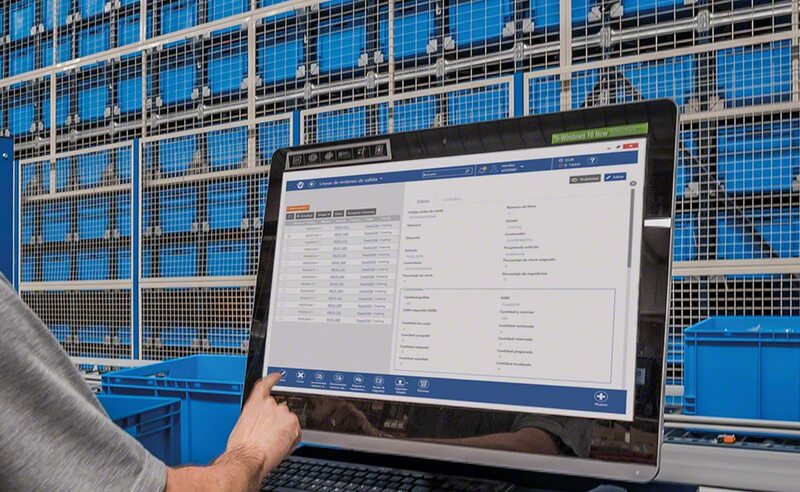 Secondly, the warehouse must include an efficient software able to manage the orders from all the channels, speed up their preparation, show inventory levels in real-time and guarantee a fluid connection between the warehouse and the primary transportation providers. Warehouses of physical shopfronts, for example, can be omnichannel by housing the stock needed to satisfy the requirements of customers who visit points-of-sale and, at the same time, prepare orders purchased over the Internet. For example, Zara, inside the Inditex group, has already opened omnichannel shops in London and Milan that aim to connect the online and offline business environments. In addition to its usual departments (men’s, women’s and children’s wear, home decor, etc. ), it has added an online section, dedicated to the purchase and pickup of orders bought over the Internet. Better collaboration between warehouses and points-of-sale. Expanded order delivery options like, for example, ‘Click & Collect’ (buy something over the Internet and collect the order in the shop a short while later). Higher capacity to offer a much broader product portfolio, with items that can better satisfy the customers’ needs. Perfect order picking and, as a result, an improvement in the brand’s image. The Mecalux technical team knows first-hand the changes in logistical needs in retailing. For this reason, it investigates and develops new software solutions so companies can face all the challenges the omnichannel trend entails. The variety and high-quality of orders that can end up being prepared in a warehouse on a daily basis make it critical to have a system that maximises simplicity in goods management. Easy WMS, the warehouse management system (WMS) developed by Mecalux, includes a function entrusted to group orders automatically as per various criteria, such as single item orders, those with more order lines, those to send out with the same transportation agency, those for suppliers, shops, online purchases, etc. Thus, the business can go from the ‘push’ system (i.e. processes are conceived according to a predicted demand) to a ‘pull’ system (the products are arranged to suit the consumer’s needs). With the ‘push’ system, orders are prepared beforehand and kept on hold awaiting distribution. On the other hand, with the ‘pull’ system, orders are only prepared when required. One of the challenges of omnichannel companies is to prepare a high number of orders comprised of very few units and varied items. Single item reception. The warehouse is ready to receive and verify items one at a time. Received item grouping. Inflowing goods are separated to identify the items requested for single-item orders, those with various lines, that must be stored, those with incidents, etc. in order to move them to the warehouse zone where they could be needed. Order grouping. The system carries out order grouping based on configurable rules. It determines what orders can be done up at the same time in the workstations. For a company, it is complicated to manage an entire transportation fleet and one that reaches all its customers. As a consequence, it needs to have a direct link to one or more transportation agencies. The Multi Carrier Shipping Software is a solution that automatically connects the warehouse with the main transportation companies. 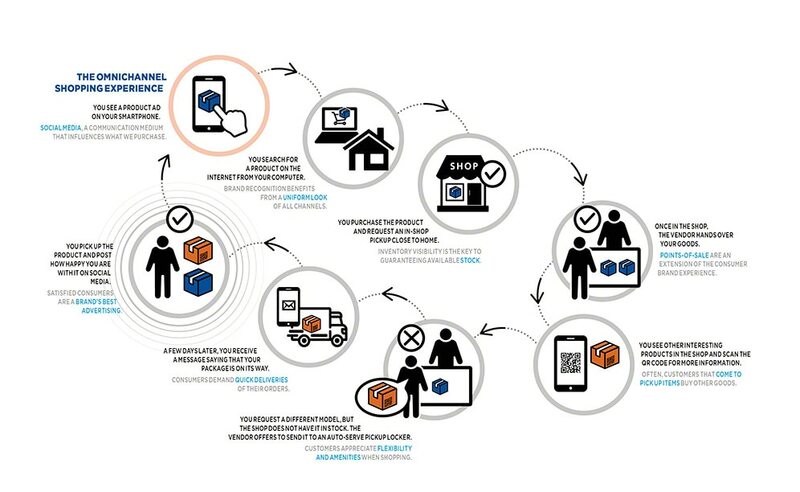 The connection happens in two ways: offline (generating and printing product labels, creating a report and a list of the packages to hand over to the carrier) and online (communicating with the agency and obtaining the carrier’s tracking code). Likewise, this software facilitates the preparation of packages before they are distributed (to package, or even, to personalise them for each customer). This operation can be completed in a specific warehouse zone or directly in the agency’s containers. Omnichannel commerce is the integration of all sales channels of a brand in order to offer a more satisfying user experience. This helps to improve the brand’s image, create fidelity and expand its market share. For this to be possible, a company’s supply chain must be completely transformed and the warehouse must become a pivotal factor. Omnichannel commerce requires logistics centres to be more productive and as efficient as possible. Good management and organisation keep situations from running out of control and ensure good customer service and, ultimately, a better shopping experience for the customer. Easy WMS is the perfect fit for controlling stock and directing all operations. The technical team at Mecalux Software Solutions investigates and develops new solutions specifically so companies can implement an omnichannel model effectively into their business. Privalia, the online fashion outlet with more than 28 million customers in Spain, Italy, Mexico and Brazil, uses Easy WMS to manage the warehouse of its logistics centre in Gavá (Barcelona). This ambitious project works with a cross-docking criterion and just-in-time order prep, which skips storage and streamlines online order preparation.